The Kupilka 44 is what I would call a plate, or maybe even a serving platter. The Kupilka 44 is made from the same natural fiber composites (as all Kupilka products are). It measures 7-1/4″ (19 cm) wide by 12″ (31 cm) long. The plate is flat throughout the center, however, around the entire edge the plate is rounded up and measures 1-1/8″ (3 cm) tall. There are form-fitting handles on each end of the plate to allow easy handling/carrying of the plate. The Kupilka 44 weighs 9.6 oz (273 g) and thanks to its raised edges can actually contain approximately 16 oz of liquids (I used water). 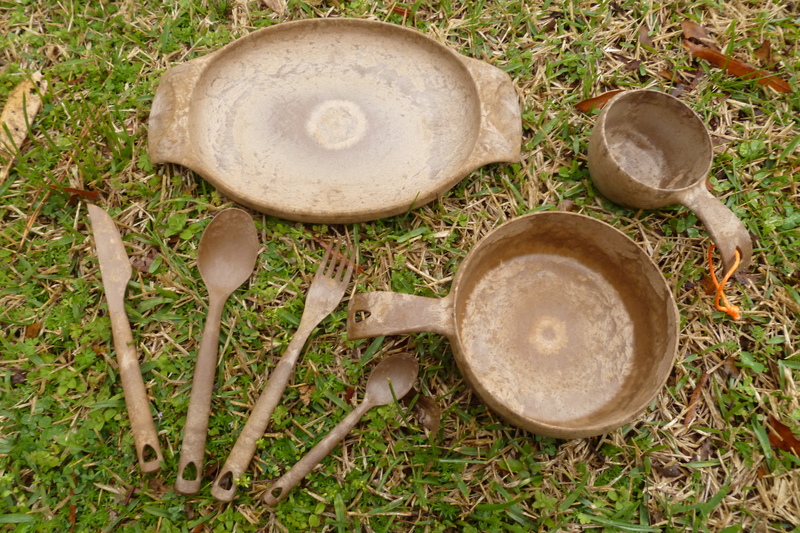 As far as the plate is concerned, I do not see myself carrying this on many backpacking trips, however, on short overnight trips in which I can splurge with food and accessories, well it is a nice option to have. I do have plans to carry this with me on car camping trips though! The Kupilka 55 is the bowl. The bowl is shaped just like the Kupilka 21, which means it is shaped to fit comfortably in my hands. On one side there is a curved handle with 2 finger holds, which allows easy handling using my thumb on top of the handle, and my pointer and middle finger wrapped under the handle. Alternately, the bowl is designed to be cupped nicely as well. (This is great for those cold mornings ~ warming up to a nice warm bowl of food!) Also, a hole is in the end of the handle so that I can attach a small piece of cord so that the bowl can be hung for whatever need I may have. The Kupilka 55 bowl has a diameter of 6″ (15 cm) and measures 2-1/8″ ( 5 cm) deep and weighs 6.3 oz (179 g). I have filled the bowl to the top with 26 fl oz of water, however, I wouldn’t put that much in it to eat with as it would be spilling over the sides. The package arrived the day before my wife and I, along with another buddy, headed out for a 2-1/2 day backpacking trip in the Smoky Mountains. I do not usually carry a bowl to eat out of on backpacking trips, but my wife does. So when this package arrived, she happily swapped out her GSI bowl for the Kupilka 55 bowl for this trip. 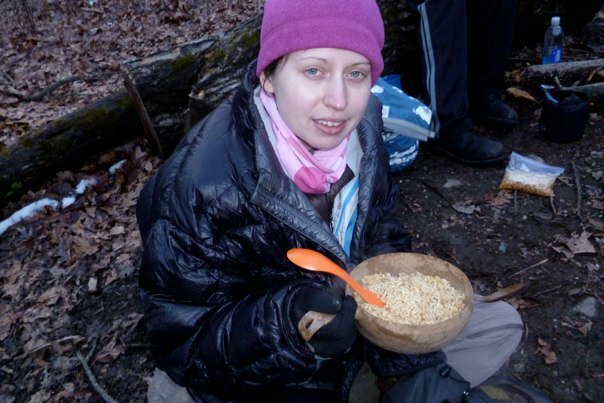 The picture above is of her eating Ramen Noodles out of it at campsite #95. She seemed happy with how the bowl fit in one hand while she used her other hand to hold her spork. Fork: No spork here, this is a real-deal fork! The business end of the fork is curved slightly up (just like it should be) and features four 1-1/4″ (3 cm) tines. The fork measures 7-3/4″ (19.5 cm) long and weighs 0.5 oz (15 g). Knife: This knife really does have an edge, although I am not sure if I could cut a steak with it. This knife would definitely work well for soft food items. I am curious to see how the “blade” will hold up over time, especially since resharpening isn’t really an option with a wooden/plastic knife. The knife measures 8″ (20 cm) long and weighs 0.5 oz (15 g). Spoon: This is actually a tablespoon. The bowl at the end of the spoon will hold 1 tbsp (15 ml) of a fluid oz. It measure 7-3/4″ (19.5 cm) long and weighs 0.6 oz (18 g). I carried this spoon with me on our recent Smokies trip instead of my REI Long Handle Ti-Ware spoon. The Kupilka spoon is only about 1/2″ (1 cm) shorter and about 0.1 oz (14 g) heavier than the REI spoon, so I was happy to give it a try! On the trip I found that I was still able to get to the bottom of the Mountain House bags without too much trouble, and since the bowl on this spoon is larger than on the REI spoon, well I was able to get much bigger bites! The only fear I have is of possibly breaking this spoon, whereas the REI spoon would only bend. So, I will see if I continue to carry it with me on backpacking trips. 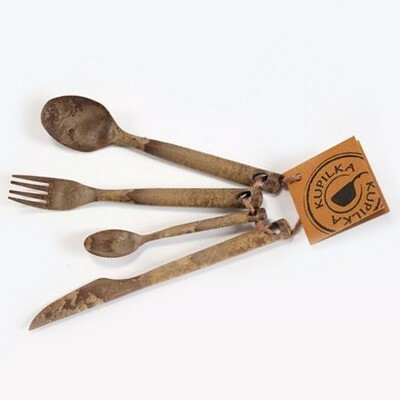 But again, this (along with the rest of the Cutlery set) will make its way with me on every car camping trip I go on. Teaspoon: The last piece of the cutlery set, and probably the last piece that I would carry on a backpacking trip. The teaspoon is in fact a teaspoon. The bowl on the teaspoon will hold 1 tsp (5 ml) of a fluid oz. The teaspoon measures 5-1/2″ (14 cm) long and weighs 0.2 oz (5 g). So, if you can picture that in your head, it is quite small. This is simply too small to use to eat with, but it would be the perfect spoon to use with the cup. It would work great to measure out sugar or creamer for a cup of coffee in the Kupilka 21, and then to stir it with. So, this will probably be the coffee spoon on car camping trips! And as far as my Kupilka 21 is concerned, well I am still loving it, even more than before. I have attached a small piece of orange Dyneema Guywire (which I got from Moutainfitter.com) to the end of the handle to make simply spotting the cup easier. These products can blend in easily with the outdoors, so a brightly colored piece of cord is a great way to lessen the chance of leaving it laying behind. I still highly recommend the Kupilka products. And I will again echo that these fine products are now available in the US at a few different locations. So, if you are interested in getting some of the Kupilka items for yourself, or for a detailed review of a few of the locations you can pick one up in the States, click here. You won’t regret it! Disclaimer: I received the above mentioned Kupilka items (all except the 21 which I had previously purchased straight from Kupilka.com) from Sports-Hansa.com, but was under no obligation to review it. This entry was posted in Food, Gear, Gear Stores and tagged Backpacking, Cup, Dyneema Guywire, Fork, GSI Bowl, Hiking, Knife, Kupilka, Kupilka 21, Kupilka 44, Kupilka 55, Kupilka Cutlery Set, Mountainfitter.com, Ramen Noodles, REI Long Handle Ti Ware Spoon, Smoky Mountains, Spoon, SportHansa, Teaspoon. Bookmark the permalink. How strong is the cutlery? I’m prone to shattering plastic forks. Think it would stand up to every day use? Thanks! I haven’t really tested them much, but I would put their durability around the same as those plastic “acetal” spoons that you can get from REI for a buck. Definitely more durable than the cheap, disposable cutlery. I have grown fond of my Kupilka cup as well. I wish they made a little larger version that would hold 12 ozs. now that would be sweet. That would be pretty nice too, but I am perfectly content with the 21 for now!